Underfloor heating works through warm water pumped through pipes laid in the floor of the room. Much lower water temperatures are required as the large surface area of the floor is enough to warm the room efficiently as the heat rises. An underfloor heating system will generally run at around 45 degrees as opposed to 80 degrees used in radiator systems, which means that there are energy and running cost savings, especially when used with renewable heat sources such as heat pumps. 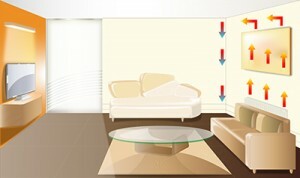 The diagrams below illustrate how the heat travels around the room in a radiator system on the left and from an underfloor heating system on the right. 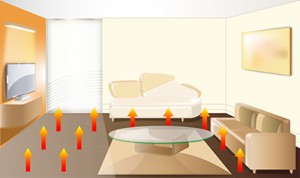 The underfloor heating system heats mainly the living area in the room, whilst the heat from the radiator system collects at the ceiling – a much less efficient heating method!